Ensign Masahisa Uemura died in a special (suicide) attack after he made a sortie with his Zero fighter carrying a 250-kg bomb at 1015 on October 26, 1944, from Cebu Air Base in the Philippines as part of the Kamikaze Special Attack Corps Yamato Squadron. He received a special two-rank posthumous promotion from Ensign to Lieutenant for his death in a special attack. He was born on July 13, 1919, and was raised in Tōkyō. In September 1943, he graduated from Rikkyō University where he was captain of the soccer club. At that time he entered the Navy and joined Mie Air Group in the Yobi Gakusei (Reserve Students) 13th Class. In January 1944, he joined the Takao (Taiwan) Air Group, and he moved to Ōmura Air Group in March 1944. In May 1944, he was commissioned as an Ensign. In July 1944, he joined the Sasebo Air Group, and he moved to Cebu Air Base in the Philippines on August 1. Masahisa Uemura wrote a well-known last letter to his daughter Motoko (see Letter to My Beloved Child). After she graduated from Rikkyō University in 1967, she went to Yasukuni Jinja (Shrine) to inform her father's spirit enshrined there about her growth, since he wrote in his last letter to her when she was an infant to go to Kudan (location of Yasukuni Jinja) if she wanted to meet him. She performed a dance (buyō) at Yasukuni in remembrance of her father. 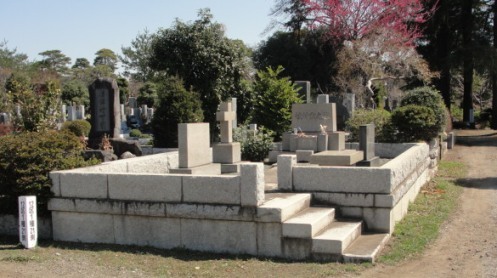 The grave monument for Masahisa Uemura is at the Uemura Family Gravesite at Tama Cemetery, the largest one in the Tōkyō Metropolis. The gravesite area has a simple stone plaque at the end with the inscription of "Uemura Family Grave." 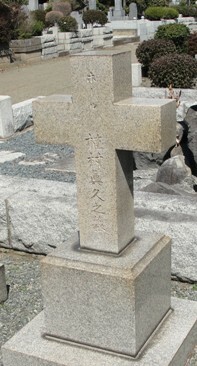 The stone cross-shaped monument has inscribed "Masahisa Uemura Grave" along with his Christian name of Paul at the top. There are another two plaques for Masahisa Uemura at the gravesite, but both have faded inscriptions that make them almost impossible to read.